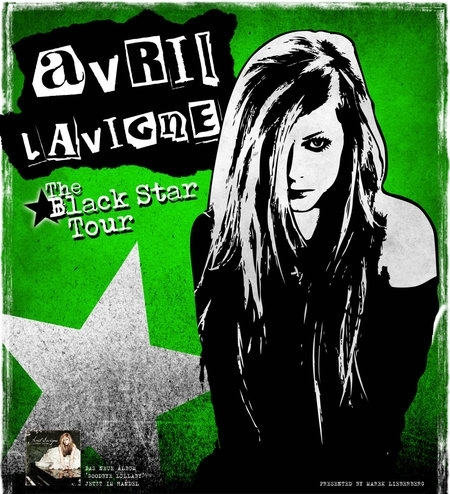 I went to Avril Lavigne's 'Black Star Tour' last night and it was amazing despite a number if different problems that affected her performance, but I'll talk more about that later. Getting there three hours early really made a difference as we were pretty much right at the front. 3rd/4th row toward the end of the night as we were pushed so much by these sneaky girls behind us trying to get in front. Upcoming British band Lawson supported Avril and they really warmed to the crowd. I did look up their stuff beforehand so it wasn't totally unfamiliar. I thought they'd stay on longer than they did, and maybe made a return once the team found out Avril would be late. Though 30 minutes after her scheduled start, she arrived blasting to the following set list. She was half an hour late due to a security issue which some claim was a car breakdown, whilst others say she was attacked. She tweeted saying she was scared for her life. Must've been serious. I really liked her performance of Alice on the piano and her 'Fix You' cover was phenomenal. I also adored her Airplanes prelude into Happy Ending, then Don't Tell Me and I'm With You. Perfect trio of songs to do back to back. Halfway through the concert she also lost her voice- she missed a high note whilst she was on the piano singing 'When You're Gone' (3:18 in this video here), smiled at her pianist, and ploughed on. Towards the end, it was clear she was struggling, but we were all just singing for her/with her anyway so it was fine. She was crying as she left which was really sad. Overall, it was amazing to see her live and it was definitely an intimate show which was nice- I'd really love to have heard more from 'Goodbye Lullaby' but due to the circumstances that took place, I'm just glad she made it at all! I cannot wait to hear more about her upcoming fifth album which is already in the works, and the rumour that she's switched to Epic from RCA could mean her next album will be more successful commercially.